January kicks off the beginning of conference play in the Scenic West Athletic Conference for the Utah State University Eastern Eagles women’s basketball team. After a stellar preseason, the team looks poised to continue their impressive campaign and make a splash during the season. During exhibition play, the Eagles tore through nearly every one of their opponents and finished with a 13-4 record. Highlighted by a pair of dominant winning-streaks, six and seven games respectively, the women’s basketball squad wasted no time creating chemistry between the returning sophomores and incoming freshmen throughout their games. With only five returning sophomore Eagles on a 14-player roster, the need to gel as a team quickly was a relative necessity. On Jan. 6, the Eagles played host to the Salt Lake Community College Bruins, who entered the game ranked seventh in the NJCAA DI women’s basketball poll. In what appeared to be a mismatch on paper, wound up being a nail-biting, see-saw game. In the first two quarters, USUE outplayed the Bruins and controlled the pace of the game. Strong team play, good defense and SLCC’s inability to hit shots contributed to the Eagles’ offensive production and allowed them to preserve a lead that they held for most of the half. However, a late push by the Bruins, and numerous turnovers by the Eagles, kept the game close and the teams went into the break with USUE leading 30-25. The third quarter saw a dramatic momentum shift swing in the Bruins’ direction as they shot out of the gate with an 8-1 run to take their first lead since early in the first. Turnovers continued to plague the Eagles and the team was unable to gain enough traction to keep up with SLCC. To make matters worse, the Bruins mounted a 14-1 run in the last half of the third and took a 47-38 lead heading into the final frame. The fourth quarter began with more of the same for USUE as the team struggled to convert on their shots and were out-hustled by the Bruins. As the quarter progressed, the Eagles started to put some offense together thanks to some great 3-point shooting by freshman Brooklynn Barrus and gritty play by sophomore Kaitlin Toluono. This renewed spirit was short lived unfortunately, as more turnovers and a tough defense by the Bruins ultimately sealed the Eagle’s fate and the team fell 62-56 to SLCC. After the game, Barrus offered a positive assessment of the loss, while also acknowledging the team’s deficiencies. “I think we played great tonight and worked hard and played well together as a team…not taking care of the ball was a huge factor towards our loss,” she said. Next up for USUE was another home game on Jan. 11 against the Colorado Northwestern Community College Spartans. This game saw a change of fortune for the Eagles and showcased the level of talent the team demonstrated during the preseason. Right from the beginning, the Eagles controlled every square inch of the court and played with a purpose the whole night. Both Toluono and newcomer Rashel Blazzard started the game with solid efforts as Toluono again fought for every rebound and every loose ball. Ball movement was again a factor in USUE’s offense, and seemingly every shot that the players took tickled the twine. After a 25-11 lead in the first quarter, the Eagles turned up the heat and thoroughly overwhelmed CNCC. The Spartans came into the game with only seven players and, by the start of the second quarter, the team looked to be running on empty. Once USUE took a 10-point lead it wasn’t a matter of if they’d increase the lead further, but when. As the second period went on, the Eagles turned their 10-point lead into a 20-point lead, then extended it to 30 by halftime. With such a substantial lead, it would have been easy for the Eagles to sit back and essentially run the rest of the clock out for the third and fourth quarters, and still manage to win the game. However, instead of letting up, the team kept its feet on the gas pedal and put up basket after basket. USUE’s lead grew even wider and at one point, led by 51 points in the fourth. When the final buzzer sounded, the Eagles had finished their rout of the Spartans 90-47. What was especially impressive about the win over CNCC was USUE’s ability to play loose, while also maintaining their competitive edge. “We were relaxed, and that’s what caused us to play better,” freshman Abby Butler said. Four of USUE’s five starters scored in the double digits, and Toluono finished with a double-double (11 points,12 rebounds). The two three-point sharpshooters, Loftus and Barrus, collectively shot 10 for 13 behind the arc and the team as a whole shot 57.4 percent from the field. 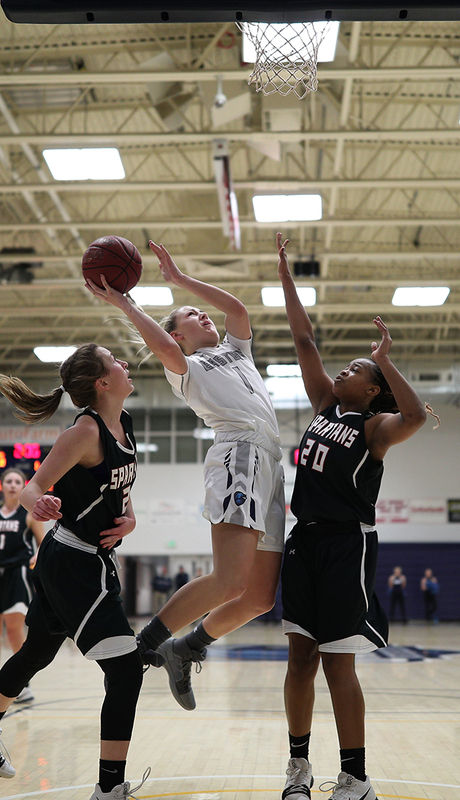 The players will look to build upon their success from the first two games and keep things rolling when they hit the road on Jan. 18 to face the Snow College Badgers. From there they will make a stop in Twin Falls, Idaho to play the College of Southern Idaho, then wrap up the trip with a rematch against CNCC on Jan. 25 in Rangely, Colorado. Stay up-to-date with the Eagles’ basketball team by visiting usueasternathletics.com, where you can view stats, check their schedule and watch games online.